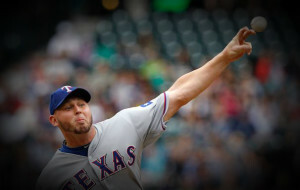 The Texas Rangers starting pitcher Matt Harrison is now projected to rejoin the Rangers sometime in September following two surgeries on his back to repair a herniated disk. The Rangers will start Harrison on a throwing program this Monday, wherein he is expected to throw on flat ground for about four to six weeks. At that point, he will be able to begin throwing off of a mound, which will take at least one month for Harrison to regain his form and endurance as a member of the starting rotation. After undergoing surgery to repair a herniated disk, a minor setback warranted a second back surgery about one week following the initial procedure. In two games this season before being placed on the 60-day DL with a herniated disk, Harrison was less than stellar. Harrison posted an 0-2 record and 8.44 ERA along with a 12/7 strikeout to walk ratio in 10 2/3 innings. Over the last two seasons, Harrison has been one of, if not the definitive leader of the Rangers’ starting rotation. In 2011, Harrison posted a 14-9 record and 3.39 ERA in 185.2 innings, improving upon those numbers with a solid 2012 campaign, wherein he posted an 18-11 record and 3.29 ERA in 213.1 innings along with two complete-game shutouts. The Texas Rangers have lost six of their last ten games and have fallen out of first-place in the AL West standings, boasting a 38-27 record.